Custom designed bracelet. $2200., pricing varies. Santa Fe Indian Market - August 18 & 19 . Booth # 775 LIN E . My daughter Lyla N. Begay will be sharing the booth with me. Please text Leroy directly at 928.607.4218 to ask him about upcoming arts & crafts shows that he will be at. You can also call him at that number. 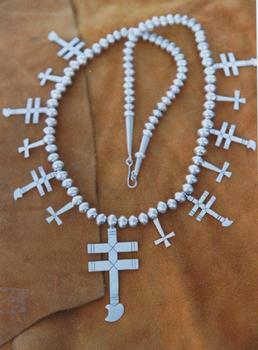 Leroy creates his jewelry by a technique called fabrication. 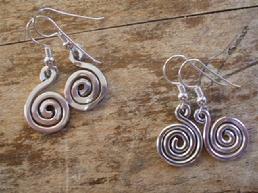 He uses sterling silver and 14k gold in sheet and wire form, and hammers, cuts, and solders it into shape. 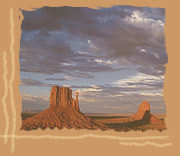 From Leroy’s extensive travels throughout the southwest, he finds inspiration for his jewelry designs. Bridges, architecture, boulders, even automobiles fuel his imagination. He is also greatly inspired by his rich Navajo heritage. Leroy has been making jewelry for over 30 years. 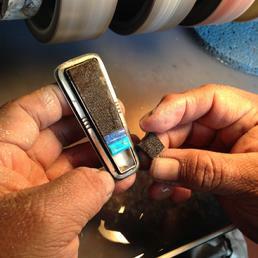 All the stones that Leroy uses for inlay as well as cabochons are natural. Circle of Life Pendant, $800.. Reverse, Circle of Life Pendant. This beautiful guitar strap has four First Phase conchos with a satin finish. In keeping with the true first phase style, the entire strap is put together in the old way; no hardware, only leather straps and laces. Guitarist Kurt Hauser ordered this strap, the first of it's kind from Leroy Begay. Be the next in line to order one for your guitar. Pricing varies. Custom Strap for guitarist Kurt Hauser. US Marine Corps bolo tie; sterling silver, turquoise, leather braided strap. 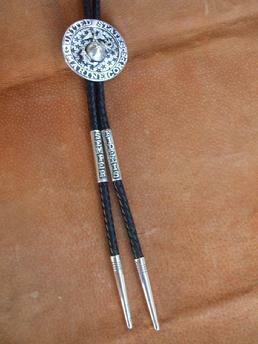 United States Marine Corps bolo tie, a commissioned work. I am not a material person, possessions mean little to me, but Leroy's pendant fills me with strong connection to my late mother and has pride of place in my life. I cannot recommend Leroy highly enough, he and Rochelle work with you to achieve exactly what you want and deliver a perfect result. They are honest people and they do what they say they are going to do, something of a rarity in our world these days.I feel lucky to be able to count them as friends.Everything is meant to be. 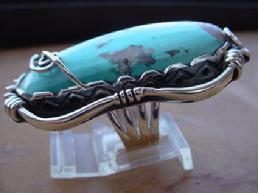 I purchased my first piece of Leroy Begay's Jewelry at a show at Fort McDowell, AZ. It was the choker bolo with turquoise pendant. I loved it. I then purchased just a choker to go with a piece of jewelry I already had. I then bought his choker bolo with inlaid naja pendant and then the dragonfly choker bolo. I love all of my pieces from Leroy. They are all beautifully made and first-rate. Leroy does custom work too. I bought a piece of Damascene from Toledo, Spain. I sent it to Leroy and he made a gold loop and a choker with gold clasps for it. I was recently in Xi'an, China where I bought a very beautiful piece of Jadeite. I mailed that to Leroy and he made a wire and a gold loop for it as well. Leroy and his wife Rochelle are first-class people. You will never be disappointed with the purchase of any of his jewelry. 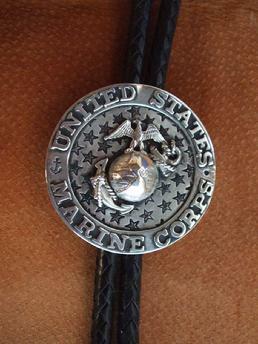 Today I received the Marine Corps bolo, and it is the greatest piece of jewelry I own. I will wear it with pride, and anyone who comments on it will hear your name. It far exceeds anything I could have expected. Thank you. In a word, the necklace is sensational!! The beauty of this piece cannot be fully appreciated until you are holding it. We both agree that this is some of the finest, museum quality work that we have seen. 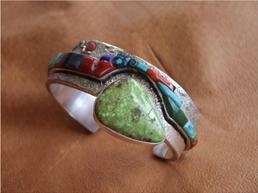 Leroy Begay's jewelry is stylish, beautifully handcrafted and as wearable in the Midwest as it is in the Southwest. and we treasure them more and more each day. You may notice that we do not have a shopping cart, or "pay now" buttons on our website. That's because the nature of our business is much more personal than a simple click and buy process. If you see a piece of jewelry that you would like to purchase, simply send us an email, and we will work with you personally. Above, a custom order for Miki Free, a Grammy and Nammy award-winning musician. 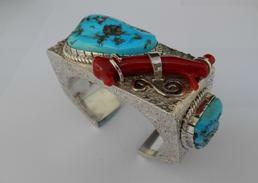 Leroy designed this ring specifically with Miki in mind.....the turquoise is from the Morenci mine in Arizona, and the silver surrounding it is fashioned as a big ceremonial drum. You will also see two arrows, a bow, and a music staff on this spectacular ring. Do you have an idea in mind for a custom piece of jewelry that reflects who you are? Leroy will work with you to create a piece of jewelry that you will treasure for a lifetime and beyond.